A first database with wood basic density values for tree species growing in exclosures in Tigray was developed. The values from the database are likely to give reliable biomass estimates also if they are applied outside the currently studied exclosures. Wood basic density (wbd) is a principal measure for characterizing wood. The main objective of this study was to obtain wbd values for tree species growing in exclosures in the Tigray region, northern Ethiopia. Stem discs for wbd determination were collected from 305 trees among the 50 most abundant tree species located in six exclosures covering wide ranges of growing conditions. The main achievement of this study was the development of a first database with wbd values for tree species growing in the exclosures of Tigray. The mean wbd value of the 50 tree species included in this database was 0.707 g cm− 3 with a range between 0.400 and 1.154 g cm− 3. 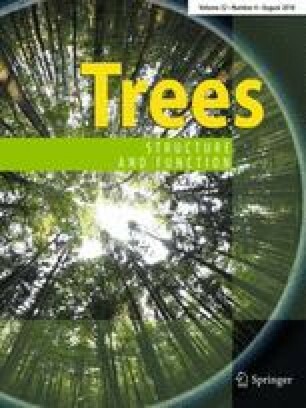 Since wide ranges of growing conditions and the most abundant tree species in the region were included, this database constitutes a solid basis for biomass and carbon estimation, and is valuable for aiding forest management decisions. The wbd values may also potentially be included in the Global Wood Density database since only a few of the 50 tree species are currently available there. For the tree species with the largest within-species wbd ranges, the ranges between exclosures are much smaller than the within-species ranges. This implies that it is likely to arrive at reliable biomass estimates also if existing wbd values are applied outside the currently studied exclosures. Still, it is recommended that future studies should test biomass models under different assumptions for determination of wbd to evaluate the effects on biomass estimation and that the wbd database should be enriched by including additional sites to capture larger ranges in growing conditions and more tree species. The study was funded through the project “Steps toward sustainable forest management with the local communities in Tigray, northern Ethiopia (ETH 13/0018)” under the Norwegian Programme for Capacity Development in Higher Education and Research for Development (NORHED). This is a collaboration project between Mekelle University, Department of Land Resources Management and Environmental Protection, Ethiopia and Norwegian University of Life Sciences, Faculty of Environmental Sciences and Natural Resource Management. Thanks go to all data collectors, particularly to Mr. Yemane Adane for his special help with field and laboratory work, to Dr. Emiru Birhane for facilitating the fieldwork, to Dr. Meley Mekonen Rannestad for commenting on an early draft of this paper and to Ellen Jessica Kayendeke for assisting in developing a map for the study sites.